We would like to wish all our members a very happy Christmas. One Norbiton is anticipating a busy 2017 as we expand our plans to organise Postcode Parties. 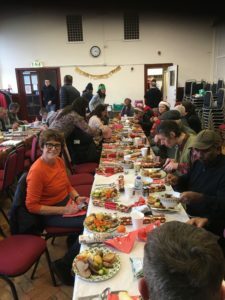 On Thursday 15th December, the MOT (Moving on Together) rehabilitation group had a Christmas Party in Queen Mary’s Hall on Cambridge Gardens. Norbiton Councillor,Linsey Cottington, kindly supported this by contributing £200 from her discretionary funds. It was a very successful occasion and over 30 men and women attended. See Photo; (Councillor Cottington is in the orange sweater). This Volunteer run Group was started by Angel Levick with some support from both the NHS and Social Services. It has now been going for over six months and provides a weekly meal, haircuts and convivial social contact for over 50 people recovering from addiction. One Norbiton and CREst allow the group to use some of our free Hall time and we provide a first aid service for any attendees in need of it. Councillor Roberts the cabinet portfolio holder for Housing, Adult Social Services and Health has informed us that RBK is about to appoint a permanent employee to support this service. We are hoping that we can get agreement for the Group to continue to operate during the Christmas period. This survey was done on the Cambridge Estate at the same time as one done by RBK to find out more about current resident views on Regeneration. Clearly there are mixed feelings and some of our residents still have not understood what is happening. At our invitation Kevin Davies, the leader of the Council, is answering questions in Piper Hall (at 6.30pm 29th November). We are awaiting for final agreement to our plans to refurbish our Community Hub in Madingley. Kevin Davies has responded to One Norbiton’s request to to speak at a public meeting on Tuesday 29th November, chaired by former Mayor Ed Naylor. He will talk about RBK’s plans for Regenerating the Cambridge Rd Estate and respond to questions from residents. Hopefully as many of you as possible will be able to find time to come to the One Norbiton AGM next Tuesday. A number of officers are up for election and we have quite a lot of news about what is happening. In future AGMs will occur in early February each year. This will enable the membership to examine and criticise the accounts before they are submitted to HMRC. The paperwork for this AGM will be sent round by email as usual but it will also be put on this site for those who want to access it on-line. The Project Plan for Refurbishing the Community Hub submitted to Housing. Our One Norbiton e-Democracy forum exists to assist sharing views on this sort of issue and we hope you will use it. RBK is surveying the opinions of Tenants and Leaseholder on this policy (click on link below) so please let them know what you think before midnight on the 9th of September 2016. A number of people have been asking for a brief explanation on what One Norbiton is all about, so four of us have written the short account below. Please use the forum to add your comments or queries. One Norbiton is a volunteer-run organisation that has been in existence for more than five years. It was set up by RBK and the Cabinet, with a single central grant from the DCLG. It is part of the Localism/ Big Society initiative that has cross-party support. When the project first started, we identified through consultation with Norbiton residents several of their key concerns and these are listed in our Governing Documents as our Aims. We also have set up a Limited Company to help with our organisation and governance and to enable us to tackle any tasks that require a bank account. 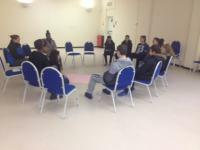 Our overriding aim is to promote mutual support and wellbeing within our community. Therefore, we are in the process of creating an internet café/Hub, using some of our original One Norbiton funding, to provide local groups and agencies a central place to work together and share experiences. We are already running several projects which directly benefit the local community and address local concerns such as the Street Drinkers’ Outreach, Surrey Save Credit Union, Foodbank and benefit checks and advice. Within this refurbished Hub we intend to establish a private office with internet access, where police can engage and interact with our local community. This facility has been requested by our local residents in every survey undertaken over many years. We feel that it will enable the Police to provide crime prevention advice directly into one of Kingston’s hotspots for drugs, anti-social behaviour and domestic violence; which are the three highest reported crimes in Norbiton. We now have a Community Working Group of volunteers from all parts of the ward and run an eDemocracy forum of over 150 members to facilitate contributions from all who live, work or study in Norbiton. With the feedback, received the March drop-in is going to be between 4-8. Future timings of the drop-in’s are to be confirmed going forward but Jill will post further to let you know when these have been confirmed by RBK.